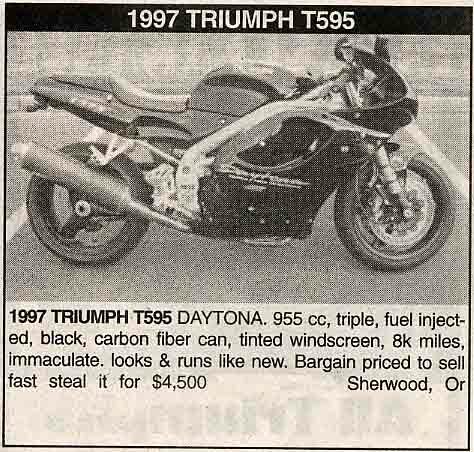 Well, the 1997 Triumph Daytona I wanted on ebay went for too much ($5500), so I was totally bummed out. Even though I just searched a few hours previous, I decided to do a search on Cycle Trader anyway, just to remind me that they were all $6,500. But this time there was actually something new... something new since the last time I ran the search. 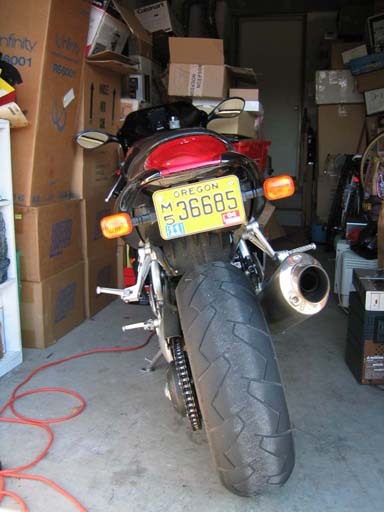 A 1997 Triumph Daytona T595 with 8,500 miles for $4,500! It must have JUST been posted. I called the guy right away and setup a showing for Sunday with a mechanic friend of mine to inspect it. I was the first guy to call (he was amazed how quickly he got a call). After looking at the bike on Sunday I offered the man $4200. We split the difference at $4350. Great deal. This bike looked totally flawless. We went to the DMV to transfer the title, but apparently since it was a theft recovery bike the DMV was going to issue a damaged title even though we had paper work saying it was not salvage and was recovered in perfect shape. They said the paper work was good, but that they also needed one very specific piece of paper. What a drag. The guy would have let me take the bike today (I had paid him), but not knowing if he could get that piece of paper (he said he could), I didn't want to risk it. He gave me my money back (but I had him keep $300 for deposit) and said he'd let me know when he got the document. FINALLY picked the bike up! Today DMV told us that they needed a hard copy of the title, even though Washington (the state that it was previously titled in) does paperless titles and we had a document in lieu of title. So, the guy I bought it from is going to try and get an official title from the auction house. Should take a couple weeks. Anyway, I road it home (8 miles) without incident. Didn't really have any fun really, since I was riding in traffic AND on the street for the first time in my life! 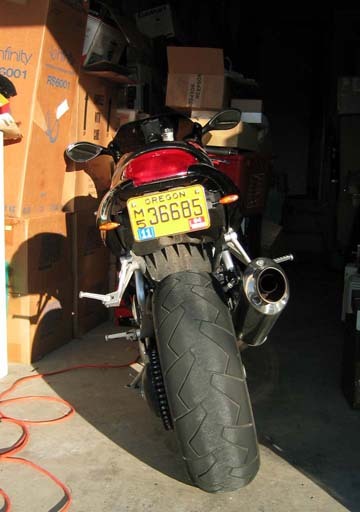 Naturally, though, once I got home I decided to push the bike around to put it into the garage backwards. As I was doing so the weight suddenly shifted away from me, and I DROPPED this beautiful bike 10 minutes after owning it! I quickly picked it up and inspected the damage. Some scratches on the right side faring, and a busted right turn signal. Not bad... well, I had resigned myself to the fact that I would probably drop this bike, being that it is my first one and all, and I just got it out of the way the first day of ownership! Oh well. I honestly wasn't all that upset, and I'm sure it's because I convinced myself it'd happen eventually. I got some super glue and repaired the turn signal to as good as new. Also picked up a Cycle Trader that had my bike in it. Funny thing is the bike was sold a week before this issue even hit the news stand. I really like them. Installation was very quick and straight forward. The very first time out on the bike with the new turn signals I got a comment from the gas station attendant. "Boy, they sure do make tiny turn signals for these things now! They're great lookin' though!" I explained that I just installed them. He seemed to think that was a strange concept. Front signals will be coming soon, once I pin-point which ones I want.